You know those foods that you just really love but don’t let yourself indulge in too often because when you do your animal brain goes nuts and just can’t stop eating? Yeah, well, homemade granola is that for me. Especially homemade paleo granola. Because it’s basically just chunky clusters of nuts and seeds sweetened and spiced. In addition to being incredibly delicious it’s also insanely crunchy which alone would be enough to make me love it. I don’t know what it is exactly about crunchy foods but I can’t get enough of them – carrot sticks, tortilla chips…if it’s got crunch it’s got my name written all over it. I would be an absolute nightmare for anyone with misophonia…sorry! 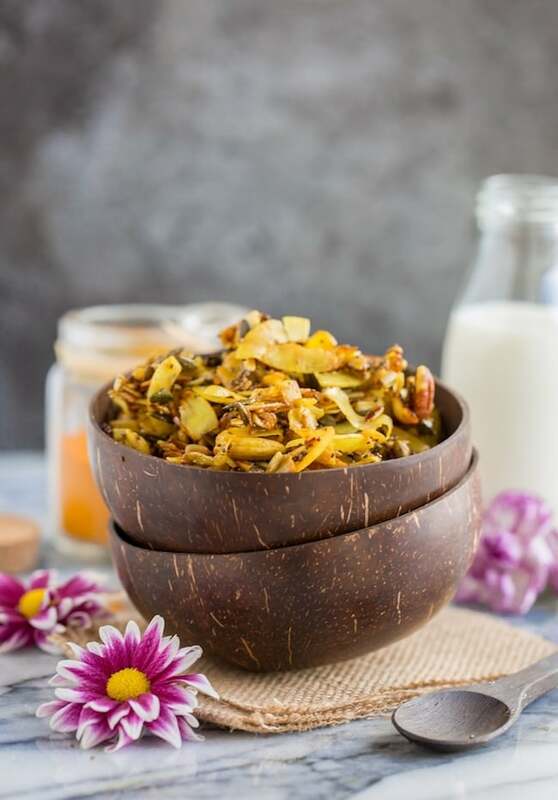 And even if I wasn’t completely obsessed with all things crunchy I’d still be obsessed with this paleo granola because it’s just that damn good. This granola comes together in about 15 minutes with only 10 ingredients. All you need is a few minutes of prep – gathering your ingredients and tossing them together in a bowl and then about 10ish minutes stirring and toasting on the stove top. You’ll need to stir constantly as it cooks on a medium low heat. The idea is to a) keep everything from burning and b) make sure everything has a nice, even crunch. Once your granola is toasted and slightly sticky just spread it out on a baking paper lined tray and let the granola cool off into crunchy little clusters for a couple of minutes. The great thing about making your own homemade paleo granola is the fact that you can really customise it to how you like. 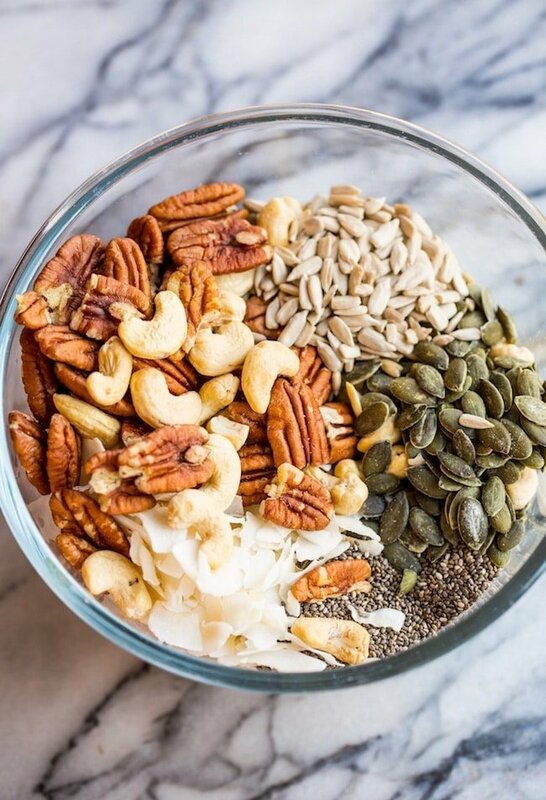 Play around with different types of nuts, seeds and spices to make something that you really love. At the end feel free to throw in a handful of chocolate chunks (but make sure to do that after it’s all cooled down) or dried fruit. Once you get the hang of it you’ll be hooked! 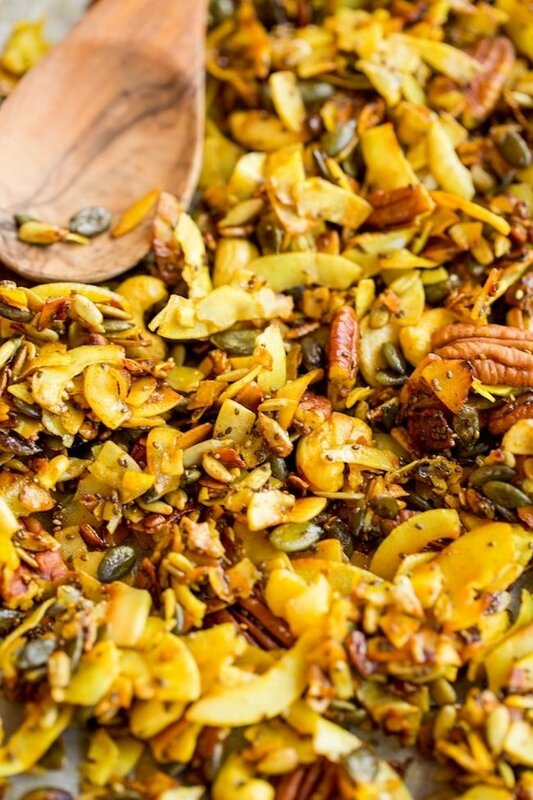 Don’t forget to #asaucykitchen on instagram if you try this Turmeric Stove Top Paleo Granola! We love seeing what you make! You can also post your pictures to my facebook page! 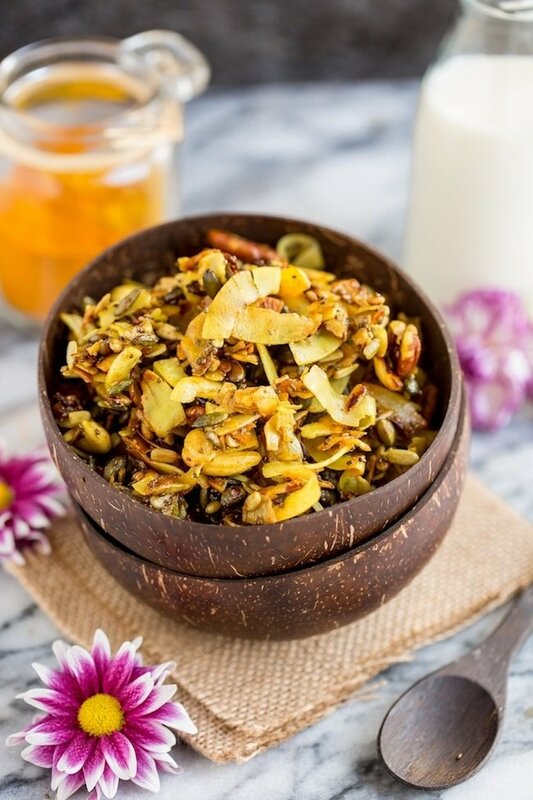 In a medium sized mixing bowl mix together the coconut, seeds, nuts, cinnamon and turmeric. In a large non stick skillet, heat the coconut oil on a medium-low heat. Add the nut and seed mixture to the warmed skillet and toast, stirring constantly for 5 minutes. You need to keep stirring to keep from burning. Stir in the vanilla extract and maple and cook for another 3-4 minutes. The mixture will be sticky and starting to turn golden brown. Remove from the heat. Line a large baking sheet with baking paper and transfer the granola to the sheet, spreading out in an even layer to let the granola cool into crunchy clusters. Store this granola in an airtight, sealed container for for 2-3 weeks at room temperature. 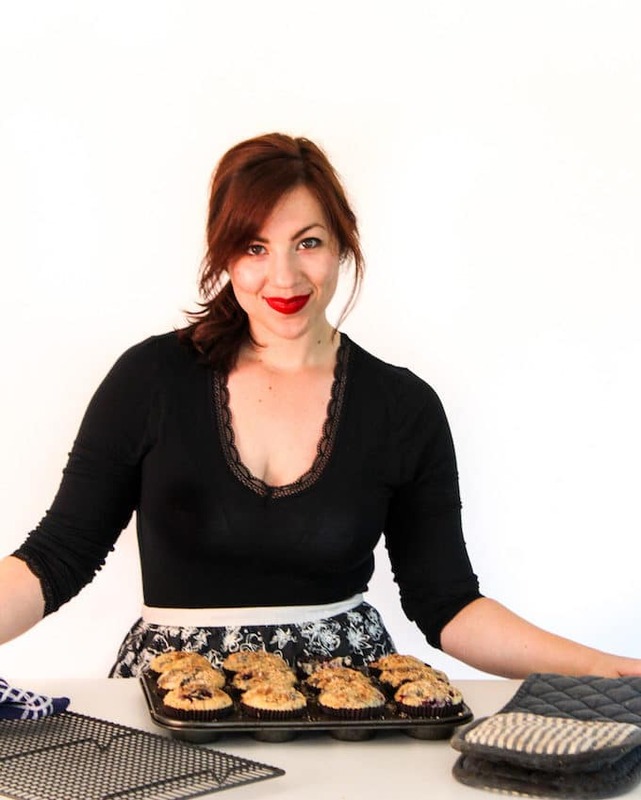 This recipe makes about 3 1/2 cups. I serving is about 1/4 cup. Do you think this could be made in the oven? I don’t have non-stick cookware.